In 1992, GMC re-branded their line of full-sized Jimmy SUVs as the GMC Yukon. This large SUV inherited the same build and body as the Jimmy as well as the Chevrolet Blazer, which was later rebadged as the TrailBlazer. After 1994, GMC produced a four-door model of the Yukon, which was more appealing to families. In 2000, another remodeling of this line of SUVs added advanced stability control to reduce the possibility of a rollover accident. Changes in 2007 resulted in increased fuel efficiency and significant cosmetic alterations. Additionally, GMC added the Yukon XL to provide a larger full-sized model similar to the Chevy Suburban. This model was updated 2003 to include improved stability control as well as some fuel efficiency and performance improvements. 2007 saw more substantial cosmetic changes in addition to standard safety feature advancements. While these changes have improved the overall quality and safety features onboard both the smaller Yukon and larger Yukon XL, these vehicles maintain a relatively higher chance of rolling over during a tight turn or after side impact. After rollover accidents, these vehicles may be too heavy for the roof support pillars, resulting in massive roof collapse. These collapses can crush the passenger cabin, causing motorists to suffer severe injuries to the head and neck. The National Highway Traffic Safety Administration rates the Yukon and Yukon XL three of five stars in the rollover crash tests. This means that these full-sized SUVs have a high center of gravity and relatively insufficient stability control to keep the vehicles on their wheels in case of a sharp turn or side impact accident, as compared to sedans or coupes. With somewhat mediocre rollover ratings, the GMC Yukon and Yukon XL also present a significant threat of roof crush injuries. If the vehicle is flipped and begins to roll, the full weight of the vehicle may rest on the support beams connecting roof to the body of the vehicle. Given the weight of these immense vehicles, the support beams may not be strong enough to prevent the roof from collapsing into the cabin. As a result, the passengers and driver can sustain serious head and neck injuries. These injuries may require immediate emergency care and can later result in long-term injuries. A roof crush injury can leave a motorist and his or her family facing substantial medical bills for both emergency and long-term care. However, a compensation lawsuit may be able to help the individual secure compensation from the party at fault for the injury. 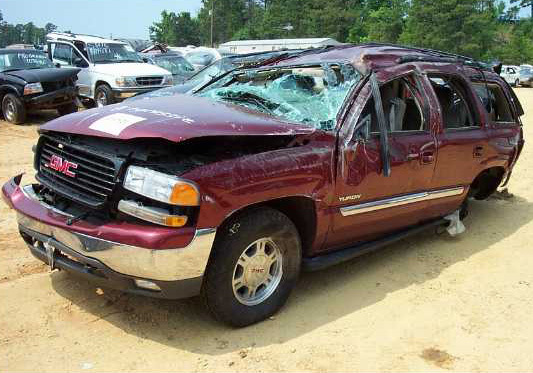 If you or someone you love has sustained an injury from a GMC Yukon or GMC Yukon XL roof crush, we may be able to assist you with the otherwise difficult and stressful process of filing a personal injury lawsuit. For a no-cost consultation with an experienced legal advisor, contact the Willis Law Firm today at 800-883-9858 and learn more about your legal rights and options.